How I remember those days with the back to school jitters and those last minute shopping trips to buy some new pieces for the school year. I wish Forever 21 was around back in my 'back to school' days (i'm sadly making myself sound like a grandma right now) it would have definitely offered more options at my family's price point. If you're still in that frenzy, you're in luck because I have teamed up with these fab bloggers to giveaway an $80 gift card to Forever 21! *THIS GIVEAWAY IS NOT SPONSORED BY OR IN AFFILIATION WITH FOREVER 21 STORES. *Enter using any of the Rafflecopter choices available for entry on the widget below. *Contest is open to US and International Readers and to those who are 18 or older or have parental consent! *Sweepstakes ends at midnight EST on September 18, 2014. The sweepstakes winners will be announced by September 19, 2014. NOTE - You must complete the specified REQUIRED entry task in order to be eligible to win the contest. If you hit the green entry button without completing the task, your entry will be disqualified. *Winners will be chosen randomly. The winner will receive an electronic Forever 21 Gift card valued at $80. *If you are chosen, you will be notified via e-mail. Winners must respond within 24 hours of being contacted. If you do not respond within that period, another winner will be chosen. I haven't shopped in so long because I keep telling myself I'll shop when I loose some weight so this would be great motivation to keep going! Fingers crossed! I'd love to get some new fall clothes for myself and my daughter! I never tried anything from Forever21 but I really like their style so I would love to have the opportunity to buy something from there. Would live this as a second year poor teacher! My closet could definitely use some updating! I'd like to win because I need to buy some few clothes for my winter wardrobe! Porque necesito renovar mi ropa, está muy antigua!! I would get clothes for my and my daughter. I would love to win this for my daughter. She loves Forever 21. I would like to win this gift card, because i need some new clothes for fall. Because I love Forever 21 and I could use some new clothes! I would love to win this giveaway to buy some new sweaters and flannels for the upcoming fall season! Thanks for the giveaway!! My daughter loves Forever 21 and her birthday is coming! LOVE Forever 21! Woudl love to go shopping! I have two growing teenage girls that need some new clothes :) Money is a bit tight so I would love to win this . I'd love to get some new clothes for myself. I would like to win this card because I need to buy a new pair of jeans. Because I'd love to get a nice dress! This would be a perfect way to stock up on my clothes since i don't really have a lot with me cause i'm away from my home country and i couldn't bring a lot of clothes but only basic. If i win i could add some more character to my outfit. I'd love to win this because I rarely have the chance to go to Forever 21. I would love to win this because today in my birthday, so i need a clothes for university, a gift and love forever21!! I could use some new school clothes so winning this would be awesome! Why wouldn't I love to win this?! like you said, F21 has great prices for students and I'd love to buy a few new pieces for myself and for a friends birthday coming up! I would love to win this gift card because I love the huge size range that Forever 21 has, the great styles and prices! I would love to win because Forever 21 is such a huge one-stop shop for all my fashion needs! It will add more pieces to my closet for my fashion blog OOTDs as well! I'd love to win this because I love their clothes and I need some new winter clothing. I dont have much money to spend on clothes because my budget always goes to food and school stuff since i'm studying away from my family. i'm actually an electronics engineering student in the Philippines who goes to school to whatever i find in my closet, not noticing if its decent or not so if i win this one i get to have decent clothes to wear to school and also my birthday is coming real soon, it would be a perfect gift for me. I would love to win this because with two teenage daughters and myself it takes a lot to get just the essentials. i'd like to win for christmas presents. Because I am in need of some new things for the winter and I love Forever 21! 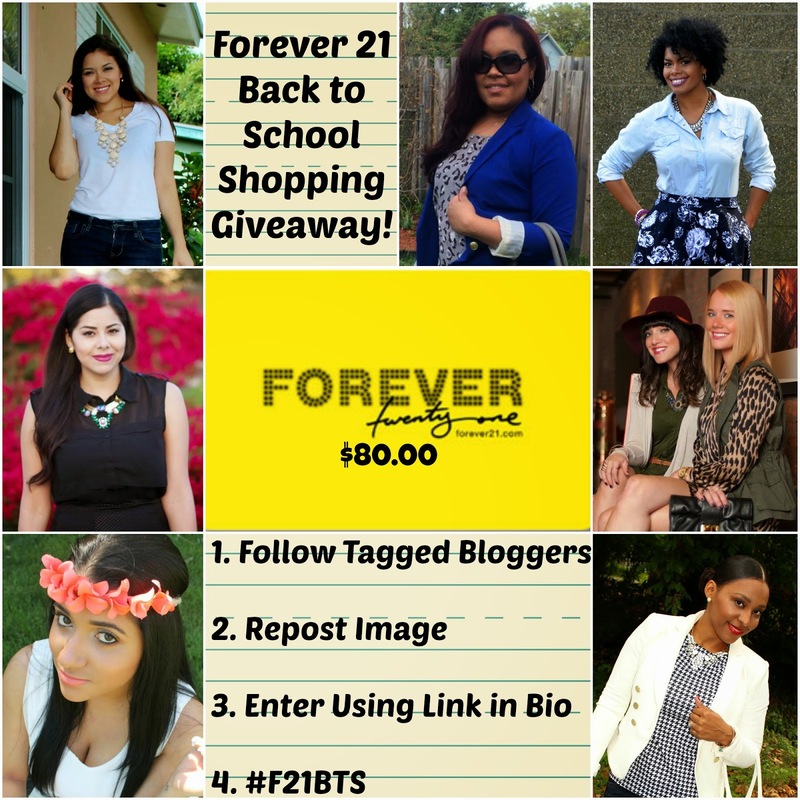 I want to win because I Love Forever 21 and I Love the "back to school shopping" days. See what it is in fashion, combine colors and accessories. I don't know, I just Love this time of the year. fantastic!!! i want to win! I would like to win so I can buy awesome things for school! I want to win it for my niece. She just started college I know she would love to have a little shopping spree.